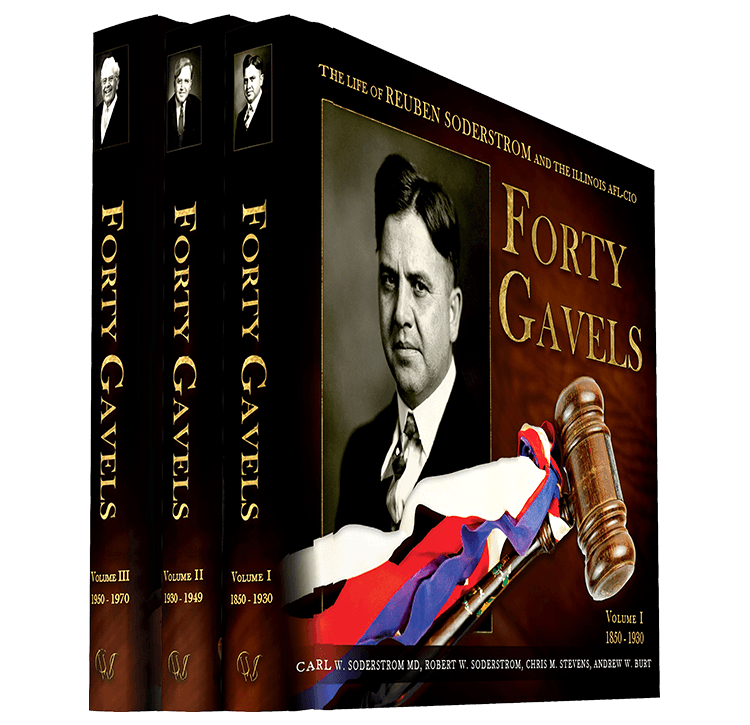 Forty Gavels is the groundbreaking, three-volume biography of the American Labor Movement’s legendary leader, Reuben G. Soderstrom. As President of the Illinois State Federation of Labor and the Illinois AFL-CIO from 1930 to 1970--receiving a gavel for every year of his leadership--Soderstrom led one of the nation’s largest labor organizations through the most challenging, exciting, and impactful events of the twentieth century. From the horrors and sacrifice of the Great Depression and World War II to the triumphs of post-war recovery, the great merger of the AFL-CIO and on to the struggles and successes of the Civil Rights Movement, Soderstrom was there, forging a legacy as organized labor’s most prolific voice. Adopting a year-by-year study of these years, this three-volume biography follows him to violent front-line strikes, rowdy union meetings in Chicago, and policy summits at the White House, making Forty Gavels one of the most in-depth studies of the American Labor Movement ever made. Born in 1888 to impoverished immigrants in rural Minnesota, 12-year-old Reuben is sent to the faraway city of Streator, Illinois, to pay off the family’s debts. He labors on trolley lines and in glass factories before finding steady work at a local newspaper print shop, where he becomes captivated by the news stories of the day and catches the attention of labor leader John Williams. Under Williams’ tutelage, the young Soderstrom embarks on a decade of self-disciplined study at the Streator public library and then barnstorms though the Midwest as a political activist and linotype apprentice. Returning to Streator in 1918, Reuben is propelled into the Illinois Statehouse, where he serves as an aggressive voice for organized labor. This volume ends in 1930 with Soderstrom on the precipice of becoming President of the ISFL, as the Great Depression blankets the nation. Soderstrom is elected president of the Illinois State Federation of Labor, a victory complicated by the Great Depression threatening to destroy organized labor. But Reuben rallies workers across Illinois—one of the nation’s most industrialized states—and holds the ISFL together by sheer will until Roosevelt’s New Deal helps turn the tide. World War II then brings a manufacturing boost powered by extraordinarily productive union men and women, strengthening Reuben’s Federation in Illinois and increasing his influence on the national stage. Soderstrom gains further advances for his growing membership as he successfully navigates the post-war strikes that hurt labor’s standing in the rest of the country. But political setbacks and eventual passage of the Taft-Hartley Act deliver a devastating blow to American unions, forcing Reuben and his Federation to consider new alliances with old foes to find a way forward. Reuben reels after the passage of the Taft-Hartley Act, forcing him to fight the tide of anti-labor legislation sweeping across the country. He gains a welcome ally when he helps facilitate the great merger of the American Federation of Labor (AFL) and the Congress of Industrial Organizations (CIO). Soderstrom emerges as president of the new Illinois AFL-CIO, one of the largest and most powerful state labor organizations in the country. From this new post he leads labor through the prosperous 1950s and into the era of Civil Rights, working to heal divisions between workers of all colors, creeds, and faiths. A veteran leader in his 70s, Soderstrom develops relationships with Martin Luther King and Presidents Kennedy and Johnson as he leads more than 1 million Illinois union members into a new era. The RGS Foundation is dedicated to preserving and promoting the work and vision of Illinois Labor's most prolific advocate, Illinois AFL-CIO President Reuben G. Soderstrom. 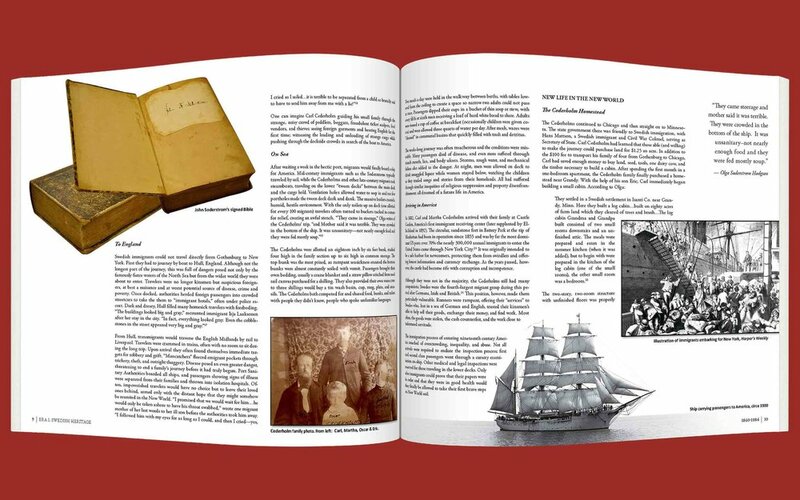 Our biographical page provides details on the life and legacy of Reuben Soderstrom, his family, and the Illinois AFL-CIO. The digital archives are home to the current and continually expanding collection of textual and audiovisual records of Soderstrom's life of public service, from his first term as an Illinois State Representative to his 40-year tenure as President of the Illinois AFL and Illinois AFL-CIO. Click on press to download informational flyers and photos of Reuben Soderstrom. Enter our tributes section to learn more about past and upcoming events concerning President Soderstrom, including the Soderstrom plaza dedication and library restoration in Streator, Illinois, as well as the upcoming release of Forty Gavels, the definitive three-volume study of the life of Reuben Soderstrom and the Illinois AFL-CIO.